There are more people on the move than ever before. Every minutes, 30 people around the world are newly displaced. Half of the world’s refugees are children and thousands take flight without the protection of parents or other family members. According to the UN, more than a million refugees had crossed into Europe by the end of 2015. The majority were fleeing conflict in Syria, Afghanistan and elsewhere. The desperate plight of people seeking safety in Europe continues, and the UN reports that more than 170,000 refugees and migrants reached Europe by sea in 2017. However, most people on the move are from poor countries, and most seek safety in nearby developing countries or within their own country’s borders. The communities who welcome them are often struggling to survive themselves. Whilst the number of refugees entering Europe fell in 2016, the number of casualties increased. In 2016, 5096 people died or went missing whilst trying to enter Europe, and more than 3081 people lost their lives in 2017. In 2018 we are campaigning on the refugee crisis through our new Share the Journey campaign. Why is CAFOD campaigning for the rights of refugees and migrants? As a development charity, CAFOD campaigns to tackle poverty and injustice. We are campaigning for refugees and migrants to be protected and treated with dignity because they are often among the poorest and most vulnerable. People who are already vulnerable – including women, children, the elderly or disabled people – are the ones who face the greatest hardship when they leave their homes. They need special protection. We are also inspired by Pope Francis, who has challenged world leaders to do more for the protection of refugees and migrants. The Catholic community in England and Wales has already shown its desire to reach out to refugees and migrants, through practical support and prayer. In 2016, over 40,000 adults and children sent messages of hope to refugees, inspired by the Lampedusa cross. What are the UN compacts on refugees and migration and what difference will they make? In 2018, world leaders will agree two new global ‘compacts’ (or agreements) at the United Nations: one on refugees and one on migration. The UN compact on refugees will be signed in September and the compact on migration will be signed in December. These UN compacts are important because they set the direction on how countries will respond to migrants and refugees for years to come. Pope Francis has spoken of this as a "unique opportunity" for Catholics to put pressure on governments who are not yet stepping up to the challenge of unprecedented global migration. This is our chance to make sure the human dignity of migrants and refugees is at the heart of these agreements. What is the Share the Journey campaign on refugees and migration calling for? Why are people looking to rebuild their lives in Europe? The increased number of refugees and migrants seeking a new life in Europe is largely a consequence of humanitarian crises around the world. The UN estimates that almost half of the people who have crossed the Mediterranean originate from Syria, where a conflict has been raging for more than seven years. Others began their journeys in Afghanistan, Iraq, Pakistan, Iran, Nigeria, Somalia and Sudan. Many of the refugees carry little more than the clothes they are wearing on their journeys. With European governments struggling to provide adequate support, tens of thousands of people every day need food, shelter, clean water and sanitation. How is CAFOD responding to the global refugee crisis? The Church is at the forefront of welcoming, protecting and integrating refugees and migrants throughout the world. We are a member of Caritas Internationalis - a confederation of Catholic aid agencies across the globe. We are campaigning for the rights of people on the move as part of the Share the Journey campaign, supported by nearly 200 Catholic organisations worldwide. Greece - We are supporting Caritas Hellas, who have provided food, water, shelter, weather-proof and warm clothing and sleeping bags to thousands of refugees arriving in Greece. They have also been supporting refugees with psycho-social support and providing social and cultural integration activities with local Greek communities. Colombia - A decades-long armed conflict has resulted in the second highest number of people forced to flee their homes in the world. CAFOD partners provide practical support and help people who have lost their homes to speak up for their rights. South Sudan - Over a million South Sudanese have fled civil war to take refuge in Uganda. Caritas Uganda is helping provide food, water and shelter. Bangladesh - More than 650,000 people are now estimated to have fled to Bangladesh, escaping violence in Myanmar. In coordination with the Bangladeshi Government and other Caritas aid agencies, Caritas Bangladesh have already reached more than 60,000 vulnerable people with food aid thanks to donations from CAFOD supporters. Kenya - Kenyan Bishops have been active and outspoken on refugee issues. The Holy Cross Catholic parish in Kakuma is the only one in the world that operates inside a refugee camp. Lebanon - CAFOD works with Palestinian, Iraqi and Syrian refugees, training young people for employment, encouraging children to play, and providing safe spaces for those who have suffered trauma. What is Pope Francis's view on the refugee crisis? Pope Francis has been outspoken on the issue of migration. He lambasted the "globalisation of indifference" on the island of Lampedusa where thousands of migrants landed, in his first visit outside Rome as Pope. On a visit to Kenya in November 2015, Francis said the world's response to the refugee crisis would be "a test of our humanity". Pope Francis has challenged world leaders to do more for the protection of refugees and migrants. Francis insists that migrants and refugees should be helped and treated with respect at every stage of migration. This includes the point of departure and the journey across borders. It also includes helping people who have arrived in host countries. The department on migrants and refugees at the Vatican has released guidance on behalf of the Pope for governments called 'Responding to Refugees and Migrants: Twenty Action Points'. The action points in this document lay out specific proposals from the Church for governments to consider. The Share the Journey campaign demands are drawn from these points. What is the position of the Catholic Church in England and Wales on the refugee and migrant crisis in Europe? CAFOD’s mandate from the Bishops’ Conference of England and Wales is to support poor communities overseas. CSAN (the Catholic Social Action Network) is the social action arm of the Catholic Church for work in England and Wales. Their members support refugees who have already arrived in the UK, and they do advocacy work on poverty in the UK. Together, CAFOD and CSAN form Caritas England and Wales. Both organisations support the Share the Journey campaign. "The refugee crisis is a huge challenge, not only in Europe and the Middle East, but in many others parts of the world where large numbers of refugees live deeply uncertain and perilous lives. Consequently, as a Catholic community, and as a country, we need to be committed to helping refugees over a long period. To sustain that effort we need moral imagination." Should the UK government accept more refugees? CAFOD, alongside other agencies, has consistently called on the UK government to accept more refugees from Syria - including women and children at risk of sexual violence, disabled people, and people who need urgent medical and psychological support. While we welcome the Prime Minister’s pledge to take 20,000 Syrian refugees under the Vulnerable Persons Relocation Scheme over the course of this Parliament, we are calling for real urgency in the government’s actions. Vulnerable Syrians don’t have 3-5 years to wait to be granted a humanitarian visa in the UK. We need the government to take steps to speed up the process of identifying and offering relocation to Syrians in the region and to ease the burden on neighbouring countries in the Middle East. In September 2016, world leaders met at two summits to discuss the refugee crisis. 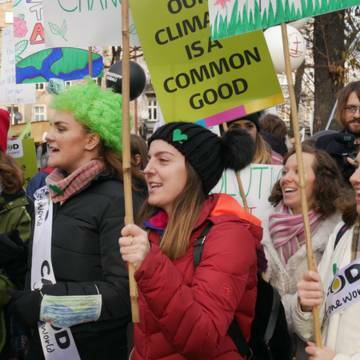 A large and varied group of organisations worked together to march in central London ahead of the summits. Dozens of CAFOD supporters held a service at St James's Church in Spanish Place to pray for refugees before joining the march. What can I do as an individual to help refugees? Join our Share the Journey campaign. We want to show how many people across England and Wales demand action to protect refugees and migrants. Please add your voice by signing our online petition to the Prime Minister Theresa May. Donate to the CAFOD Refugee Crisis Appeal to support our work with refugees arriving in Europe, and those caught up in the war in Syria who have fled to neighbouring countries. Find out more about the crisis - use our refugee crisis resources for children and young people. Help your local diocese support refugees. What can my parish or school do to help refugees? Join our Share the Journey campaign. Together we’re aiming to walk 24,900 miles – the distance around the whole world – to show solidarity with our global neighbours fleeing their homes. Every step you take, together with others across the country, will be used to send a powerful message to world leaders that they must step up too. Organise a walk. Any age can take part. As you walk, you’ll hear the stories of those forced to flee their homes, share their journeys, pray and commit to action. Add the miles you walk to our grand total from across England and Wales. Follow our progress around the world. You can organise your walk any time between now and the end of the summer. Most schools will get involved in the summer term. Refugee Week (16-24 June) would be a good focus. If you are unable to organise or join a walk, you can invite people to sign campaign cards after Mass, during assembly, in your chaplaincy or youth group instead. You can also fundraise in your parish or school and donate to the Refugee Crisis Appeal.